- Deluxe pusher tensioner. Use with closed seal or wing seal when applying steel straps. Use with wire buckles when applying PET straps. Ideal for round packages. - S246 for 3/8" ~ 3/4" x 0.025" max. steel and PET straps. - S247 for 5/8" ~ 1-1/4" x 0.035" max. steel and PET straps. We are the Supplier, Manufacturer, Exporter and Service Provider of Strap Tensioners. Leveraging on our vast experience and knowledge of this domain, we have been able to offer premium quality Combined Coil Cradle Straightener. These Combined Coil Cradle Straightener are broadly admired for their quality, longer life and hassle free performance. Different Drum sizes: For 100 Kgs to 600 Kgs Wire Weight. Max line Speed: Upto 25 Mtrs/Sec. drop stacker with air floating system for c. R. Line. 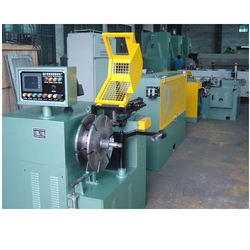 in line notching & punching system. Very popular high tensile feed-wheel tensioner for general package strapping. Regular duty strapping with 3/8" ~ 3/4" x 0.35". 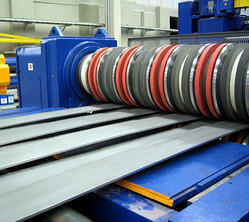 CARTEL, is a one stop solution for any and every type of requirement for the Steel Coil processing industry. We give you material handling systems, CR Hi speed Lines, Color coated sheet processing machinery, HR Coil processing right from 2 mm to 25mm, Slitting Lines for CR as well as up to 10mm HR. Its your demand and we are at it. We offer a wide range of tensioner that are widely used in different industries to seal packaging strap. The tensioner we offer are best suitable to secure straps at difficult and odd angles. These tensioner are fast & easy to use and provides correct and consistent belt tension. Apart from maintaining belt tension, tensioner also helps in reducing vibration and noise levels. CMC Offers COIL PROCESSING Equipment like cut to length line and slitting line with decoiler, leveller, shearing / sliting and recoiler for slitting. Suitable from 350 X 1 mm to 1000 X 4 mm and higher thickness from 6 mm to 16 mm of width from 1200 mm to 2500 mm. Stam Italy Offers Coil Processing Lines From Worldwide Leader STAM was established in 1963. The company employs 130 people. More than 1000 machines and lines have been delivered. Stam has strong infrastructure, man-power for fabrication, shot blasting, painting, cnc machining, electrical-hydraulic-pneumatic controls assembly-testing-software designing.